If you are looking for information on the Famous Uncle Al's Hot Dogs franchise business opportunity, Famous Uncle Al's Hot Dog and Grille franchises or Famous Uncle Al's Hot Dogs & Grill franchising, then you have come to the right place. Our Hot Dogs make us famous! brand hot dogs are the finest hot dogs available. Designed for flexible floor plans, Famous Uncle Al's restaurants are fitted with a casual lunch counter and table seating. The "famous" grill is exposed to the public for a fun atmosphere. Sitting at the counter, customers can watch the action as the hot dogs are prepared right in front of them. Table diners can enjoy a more relaxed experience with table service. Of course quick take-out service is always available. Any way the customer wants to be served they always get the best grilled hot dog available anywhere! The restaurant and system are designed for easy operation with minimal staff requirements. 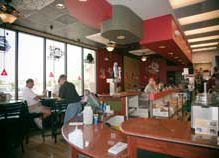 With no tedious prep time and easy cleanup the restaurants are easier to operate than most other franchised restaurants. They are 100% all meat and are manufactured to our exacting standards. Manufactured just days or hours before shipment from our manufacturing facility. Shipped directly to our distributors who in turn deliver to our stores. There is no cross docking, redistribution or other delays in shipping. Our customers enjoy the freshest possible product! Famous Uncle Al's offers Regional Developer programs and Multi-unit contracts to qualified individuals and companies. 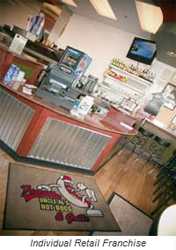 Famous Uncle Al's Hot Dogs& Grille, Inc. is dedicated to continuous and comprehensive support of our franchisees. A member of our team is with you every step of the way to guide and advise. We are 100% committed to building a strong, loyal and prosperous franchisee community! Famous Uncle Al's Hot Dogs & Grille, Inc. is committed to increasing the value of each franchise through strategic expansion programs. We are always looking for new growth markets and excited individuals to join the Famous Uncle Al's Hot Dogs & Grille, Inc. family. 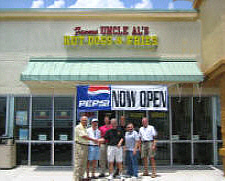 Famous Uncle Al's Hot Dogs & Grille, Inc. offers single unit franchisees, multi unit development programs and Regional Developer programs.